Like some of you (but unlike many of you), I have never had significant experience with theater (re?) before our time in London. Well, okay, I was a penguin in my local theater’s production of Mary Poppins when I was in third grade, but other than that, I didn’t act, sing, or dance in school plays, high school or college, I was never on a stage crew or in a costume shop, and I didn’t make annual trips to Broadway as a fun family outing. There’s really not much theatre in my town. So, for me, the best theatre experience I’ve had in London was actually our crash course in West End shows by Dickinson alum Rick Fisher. I didn’t come to London a theatre buff, and I’m not leaving London a theatre buff. But I like to think I’ve expanded my horizons by combining the more pedagogical yet also personal approach by Rick with the actual experience of seeing the plays. Without Rick’s background, I’m not sure I could have enjoyed the productions quite so much. It’s also helpful to be around people who are interested in theatre, and encourage discussion about it after the show (thanks, guys). Since the Tate Modern is a global museum and most of its exhibitions are free, there were a lot of people. The escalators and large spaces reminded me of a shopping mall. Its quite a contrast with the Charles Dickens museum, yet both are museums, right? At the Tate Britain, I was greeted with a smaller crowd. The day that I went to the Tate Modern I was tired, and trying to view the artworks with an open mind is hard to do when there are hordes of people blocking the works from all angles. TB had no such problems. It itself is an impressive museum with an emphasis on British art (duh) but with a respectable collection of international modern art. 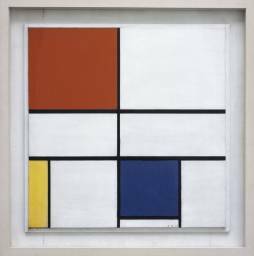 I even saw a Mondrian painting. I must’ve been sitting in front of it for nearly half an hour. The painting’s greatest virtue is precisely that it is straightforward and pure. In this sense, its somewhat ironic to call it a piece of abstract art. I like it very much, and was impressed at the evocative power of a most primordial form. The painting even looks like a tatami, a seeming reference to the qualities of humility and tranquility that are intrinsic to Japanese culture. I saw advertisements about an exhibition at the TB exclusively on Eadweard Muybridge, arguably the first person to invent the ontological nature of the cinema. Enough said. The entrance fee was 10 pounds but I didn’t mind. The Muybridge was a fantastic exhibition, much more extensive that I had imagined; there must been at least six rooms. I also appreciated that there was a chronological order to the exhibition, beginning with Muybridge’s photographs from his early years to the prints from the zoetropes in his later. A proper tribute (and indeed, much deserving) to a pioneer who, although recognized in cinema history, unlike the Lumiere Brothers and Edison/Melies/Porter, is seldom talked about among academics and critics. Just looking at his prints, you realize how much of an influence he has had on the history of the medium. So grateful to have caught this. London has been good to me. If anything, one perk of living in the city is, simply, the range and accessibility you have to the arts. The fact that the high holy days of Judaism fell during our time in London gave me an opportunity to visit and pray at several different synagogues. On Rosh HaShanah (the New Year), I first went to the Central London Synagogue in the morning. It is the Orthodox Synagogue which we visited as a class. Most of the congregation wasn’t participating in the service so it didn’t really feel very spiritual. Part of the celebration of Rosh HaShanah is to hear the shofar blown. A shofar is a hollowed out ram’s horn and it has been used to communicate in Judaism for thousands of years. I was able to hear the shofar at the Central Synagogue so I was glad I went there for that. Later in the day I headed out to the Northern suburbs of London. I attended an afternoon service with one of my flat mates from my year in Israel. His synagogue was also Orthodox but I felt a lot better about that prayer experience because everyone was participating and seemed very focused. For Yom Kippur I had a unique opportunity to attend the only Independent synagogue in the UK. The Belsize Square Synagogue was originally founded by German immigrants but has since evolved and incorporated a number of other types of Jews. However, it still hangs onto its origins in the German Haskalah. Haskalah means enlightenment and it is the name given to the beginnings of the Reform movement. The movement began in Germany and was later adopted in the United States and elsewhere. Reform Judaism holds that a Jew should be entirely educated about the whole of Jewish law but then should be allowed to choose those elements of practice which are individually meaningful. In the United States, this is often perceived as a lax sect of Judaism and so, in most congregations that I have experienced, the members end up being mostly secular Jews and largely uneducated about Judaism in the least. At Belsize, however, I met a strange and unexpected contradiction. The service had the most obvious characteristics of a Reform service in the U.S. It had both a choir and organ and was given to churchy tunes at times. You see, the origins of the Haskalah were in a desire for German Jews to emulate their German Christian counterparts. This is evident not only in choir, organ, and tunes, but also in things like synagogue architecture and design. A Reform shul is far more likely to have pews instead of chairs, for instance. At first glance, Belsize Square appeared to be akin to Reform, in fact, the synagogue belonged both to the Reform and Liberal streams of British Judaism at different times but eventually decided it had to be independent. As I sat in services Friday night and all day Saturday, it became obvious why it was so different. The synagogue and community are amazingly traditional in their practices and attitude towards the service. I also noticed how well Jewishly-educated the whole of the congregation seemed to be. While I don’t usually go for the choir and organ, I was able to find more respect for it in the context of this shul because it seemed supported by more than just a desire to remain Jewish while acting as Christian as possible. The service was informed by a desire to remain close to the roots of the immigrant community which founded it but also to remain inextricably tied to traditional Judaism. I’ve never come across a synagogue and community like Belsize in the United States. Chugah, chugah, chugah, chugah PUB! PUB! The first time I walked into a pub in London it was a bit like entering an alternate universe where everything is foreign and strange. It was almost like a bar scene in Star Wars. I was with a group of friends and we spent the first five minutes walking back and forth from table to bar, unsure of what to do. We stood awkwardly at the bar then awkwardly at our table, then back to the bar only to stand awkwardly a bit more. Eventually, we managed to be served which is better than I can say for a couple of times at the very beginning when, at the barman’s request, I sat down at pubs but then was never served. I still haven’t quite worked that one out. What I do know is that it was awfully confusing to be in a pub for the first couple of weeks that I was here in London. Have good American beers (sorry for this one, Professor Qualls). I’ve become accustomed to drinking lots of delicious IPAs and Stouts which I haven’t been able to find in pubs in London. One really good IPA on draught would do wonders for my homesickness. I agree with Orwell on this one: a pub absolutely needs a fireplace or three. Not only should a pub have a fireplace but it should also have dark wood paneling, plush carpets, and comfy couches arranged around heavy wooden tables. All of this adds to the antiqueness and hominess of the pub. A logical extension of such cozy décor is something I’ve been told some pubs do as the days grow shorter. That is, pubs should have available delicious wintery hot drinks: hot chocolate with Bailey’s or peppermint schnapps, warm mulled wine, and hot cider with cinnamon sticks. As Fox talks about, the pub almost serves as a place of asylum, a neutral ground where the other rules of British culture melt away. Nothing would be better in helping them melt away than a nice warm alcoholic drink. England’s climate begs for it. I look forward to that in the winterier months. Lots of good games. I realize that this might be partially against the ethic of the pub but I really like table tennis. Any pub with table tennis and a good IPA would make me a regular. I think that about does it. I’m obviously not quite as picky as Orwell nor as cynical. I believe that I will find my pub, just as I want it, it’s only a matter of time.